The aroma of autumn will fill your home when you bake this butternut squash marinated in sweet fruits and spices. This casserole is versatile. It can be your “main” dish, served with crusty bread and a big salad, or a complementary side dish to baked fish, turkey, or chicken. It will be one of the side dishes at our Thanksgiving meal this year. Wash and cut your squash in half and lay each half with cut side down in a baking pan. Place the squash into the oven. It will bake for a total of approximately 1 1/2-2 hours. Set the timer for 45 minutes. Wash and core the apples and pear, wrap each in foil and place together in a baking pan. At 45 minutes, place the apples and pear in the oven to continue baking with the squash. Set the timer for 60 minutes. The butternut squash should be almost fully cooked at 60 more minutes. Remove from the oven and carefully scoop out the seeds and pulp from each piece. Place each piece on a cutting board and slice off the skin. BE CAREFUL when working with steaming hot food. I use a large serving fork and my kitchen knife. 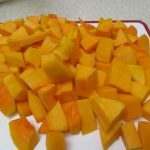 Once the seeds, pulp, and skin are removed from the squash, cut it into large chunks and place into a baking dish. Cover with sliced onion and place the two sage leaves on top. Remove the apples and pear from the oven and carefully slice. The apples will be mushy. Spread the apples and pear over the squash and onion. Add the spices, toasted pecans, and cranberries. Pour apple juice over the top. Cover with foil and return to oven for approximately 15 minutes. Remove from oven when fully cooked and remove foil and sage leaves. Allow to cool a bit before serving. NOTE: Cooking times are approximate. The squash and pear are fully cooked when soft. The apples will be mushy.